Carton and case flow racks provide high-density storage solutions that help maintain a first-in-first-out inventory flow. Utilizing gravity flow wheels, these racks are designed to handle a wide variety of case sizes and weights to fit exactly what your operation needs. The storage racks can also handle varying depths and storage capacities so you don’t have to worry about whether your warehouse is big enough or not. Will You Benefit From Carton Flow and Case Flow Storage Racks? Carton flow and case flow racks are ideal for picking full cartons or split-cases. They provide order picking access to a high quantity of SKU locations in a relatively small space, which allows for greater pick rates and overall productivity for your company. Even if you don’t currently have a variety of SKUs, having these racks available as you grow will save you time, money and tremendous headaches. 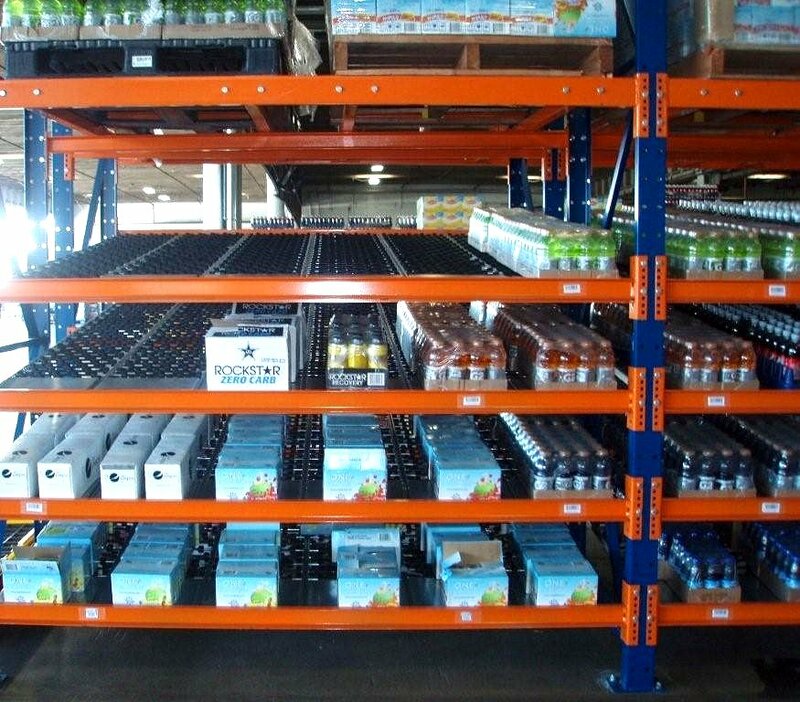 Carton flow and case flow racks can be designed and utilized as stand-alone racks or can be integrated into pallet rack for overhead storage. It can also be designed as part of a multi-level structure and pick-module design for order fulfillment operations. The racks are available with a wide variety of wheel designs and configurations. Light, medium and heavy-duty applications and products can utilize the flow systems. Carton flow and case flow racks employ a modular design to accommodate varying shelves and shelf heights, lanes per shelf, wheels per lane, and so forth. Choose from infinite adjustability for carton and lane widths to accommodate SKU slotting changes. Carton flow and case flow racks come with a variety of accessories to best meet requirements including lane dividers, entry impact plates, tilted shelves for easy product access and many more. Our design engineers base our solutions on a deep understanding of your storage and operational needs, including inventory requirements, SKU and cubic velocities, replenishment requirements, pick-rates, order cycle times and space requirements. If you have products that you need continuous and easy access to, a carton and case flow rack system is a great solution for you! Call us today at (866) 266-2244 and let us address your needs.